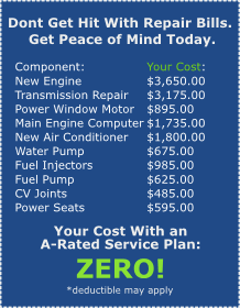 Rest assured with a vehicle service agreement. We offer a vehicle service contract that will cover your engine, transmission, transfer case and drive axle, at a minimum. Premium service plans are also available, which will cover practically all the mechanical and electrical components of your car. When you purchase your new car, the manufacturer usually provides a limited warranty, and the dealer offers you an extended warranty to cover other anticipated repairs. Additionally, when your car comes off warranty, the expense of repairs could become prohibitive. You now have the option to purchase a car maintenance agreement from an after-market vehicle protection plan provider who provides comprehensive coverage. 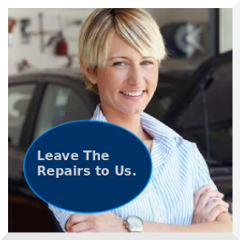 You won't have to wait days for the dealer to repair your car; simply take your vehicle to an approved mechanic. You could save thousands in the long run. We can provide you with a vehicle service contract that covers your car for up to 7 years or 100,000 miles, and protects most all of the primary parts such as the engine, drive train, transmission, and electrical system. Our vehicle service plan can include premium member benefits like roadside service, rental vehicle assistance, and tire protection. If your original warranty has expired, contact us today to discuss a vehicle service contract that will meet your needs. To Get Started, Select Your Make.